I find theology to be especially enjoyable in a setting like this: an impromptu discussion leaves room for movement and discovery; it’s more playful and impressionistic than a formal lecture, more inventive and exploratory than a scholarly paper. Anyhow, it did my heart good to see such an impressive gathering of theologians and university students. The event seems to offer a vibrant and theologically robust alternative to both the colourless conservatism and limp liberalism that one so often encounters in Australian church life. 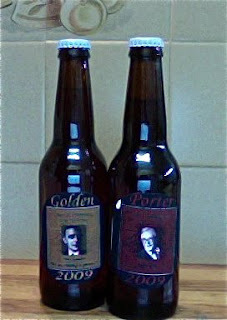 Best of all, each year the School of Discipleship creates its own themed range of beers: this year they had the Barmen Collection, including the Hans Asmussen Golden and the Karl Barth Porter (pictured). And speaking of Barmen and discipleship, I’ve decided to set one of Bonhoeffer’s books for my undergraduate course on ecclesiology this semester. (After the lecture each week, a selection from the book will be the focus of a one-hour discussion, so that we’ve pretty much explored the whole book by the end of semester.) But I still haven’t decided between Discipleship (a richer, deeper work) and Life Together (shorter, more practical and accessible). Anyone able to persuade me one way or another?